There are various shades, strengths and weaknesses to competing software packages, with vendors catering to different user segments and market success often defining the direction of their products.Knowledge Plaza is a relatively new offering in the enterprise collaboration space and offers a very sophisticated set of tools aimed primarily at knowledge workers, and whose development has been influenced by a very large international consulting company. There are various shades, strengths and weaknesses to competing software packages, with vendors catering to different user segments and market success often defining the direction of their products. 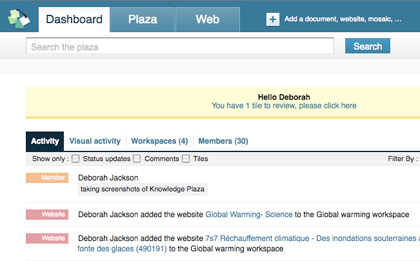 Knowledge Plaza is a relatively new offering in the enterprise collaboration space and offers a very sophisticated set of tools aimed primarily at knowledge workers, and whose development has been influenced by a very large international consulting company. There's a good online video on their site which gives a basic overview of Knowledge Plaza including a quick look at the elements of their well thought through user interface which does a great job of providing the big picture in an easily digestible way. This product is essentially a seriously powerful and secure hub around which you can aggregate both internally created and stored content, as well as material from the entire internet, which can be tagged and contextually stored. To enable organization, sharing and the mobilizing of knowledge within a company, Knowledge Plaza employ the concept of 'tiles'. These information resource 'tiles' can be external or internal web pages and sites, documents, discussions, emails, contacts and ideas which can be tagged, rated, commented upon and bookmarked contextually. 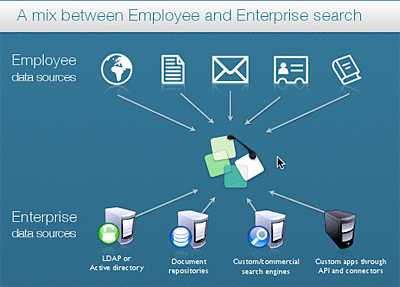 Enterprise search - often a huge problem with internal multi application collaboration environments - is a powerful feature of Knowledge Plaza, with good solid filtering mechanisms. 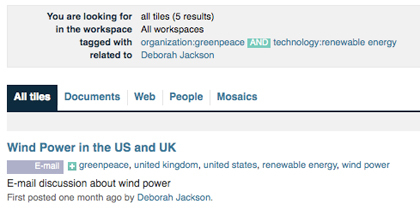 The way in which content is ingested into the 'tile' spaces enables searching by tags, subject and contributor. Searches are savable and can be subscribed to by RSS or email, so you can be notified of newly uploaded content under the parameters of your original search, a very useful, timesaving piece of functionality. There is also powerful search functionality which brings in industry standard external sites such as Google and other engines, audio and image search tools, news sites and more. It's possible to search on a topic or name in a search field and switch between search engines. The concept of 'Tiles' of vertical information can be gathered together into 'mosaics' of information along with Users, Contacts and Notes, all distilled into a confluence around a given topic in what is essentially a wiki style collaborative environment. These 'spaces' can also be exported if needed as a zip file containing pdfs, vcard contact info and copies of all referenced documents. 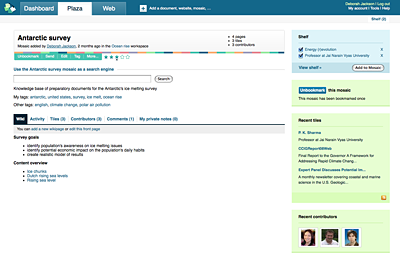 Vertical search defined by subject and permissions is at the core of Knowledge Plaza: you can define search by very narrow or broad parameters as appropriate, while sophisticated user permissions allow tight calibration of who sees what - an important feature of a product clearly designed with analysts, consultants and other information crunching professions in mind. There is a refined level of flexibility baked into the functionality of Knowledge Plaza, and the findability factor of the way content is organized demonstrates promising scaling capabilities - important as databases fill up with content. Social connectivity between team members (with allowed visibility into a project) allows congregation around a 'dashboard', which shows project statuses and discussion. It is possible to follow users Facebook style so you can see what team members are up to; from a management perspective it's also a useful interface to stay on top of the way projects are going. The intention is for Knowledge Plaza to foster social intelligence, and the impressively well thought through functionality and findability baked into this web based service sets a very high standard for this initial release. I've also seen some currently secret next generation functionality being developed that extends the product further; it will be interesting to see how this platform develops as it matures. There is bound to be some security agonizing over hosted content concerns; 256-bit AES Fully encrypted sessions and strict access controls arguably provide as secure an environment for your company sensitive information as on premise behind the firewall servers at a fraction of the cost for the software as a service version. Also offered is an on premise solution for those whose security issues necessitate that option. Overall Knowledge Plaza looks very impressive - an intuitive user interface that isn't going to alienate non techie users coupled with powerful functionality makes this a tool I can see being a primary nucleus for information wranglers.